Another common problem that reached our mailbox is on the new Samsung Galaxy S5, which according to the sender, can connect but no Internet access. "I am able to connect to a Wi-Fi network, however, I cannot browse the Internet. It seems like I'm not getting any data." Weak signal or Wi-Fi is not in range. Wireless router is not connected to the Internet. No physical connection between the Wi-Fi router and network or modem that provides Internet access. Temporary ISP (Internet Service Provider) problem. Extra login through an Internet browser. Remove the battery for at least 30 seconds, with the device remains On. Wait until the time has elapsed, then replace the battery. Step 2. Check the Wi-Fi network and make sure it is in range. HINT: Take a look at the signal strength next to the network name. You'll see the bars available in blue. These bars indicate the signal strength. If you see more bars, then that means your device should be getting better signal. Step 3. Check physical connection between the wireless router and main modem providing Internet access. HINT: Have a look at the routers' Internet LED indicator, usually on the front of the front. That LED should appear lit. If you are not sure where exactly the Internet LED indicator on your router is, contact your Internet Service Provider or router manufacturer. Step 4. Isolate the problem. Try to connect to the Internet using other available device that is connected to the same Wi-Fi network or Internet modem. If the other device is able to gain access to the Internet, then the problem is obviously on your Galaxy S5 smartphone. If the problem still exists after applying the aforesaid workarounds, try to verify the Internet is working on another device connected/attached to the same wireless network. If the either device does not have Internet connection, you have to power cycle the wireless router. Power off Wireless Router. You need to unplug the router's power cord from the main power source in this case. Leave the router unplugged for at least 30 seconds. When the time has elapsed, plug it back in then turn it On. Re-attempt connecting to the Internet. If after you rebooted your wireless router you still cannot connect to the Internet, please contact your ISP for further troubleshooting. Otherwise, you may also try to Re-add Wi-Fi network. Touch Wi-Fi to get to your phone's wireless configuration. On the next screen, touch and hold the network name then touch the caption that says, "Forget Network." Doing so will remove the current Wi-Fi network from your device. 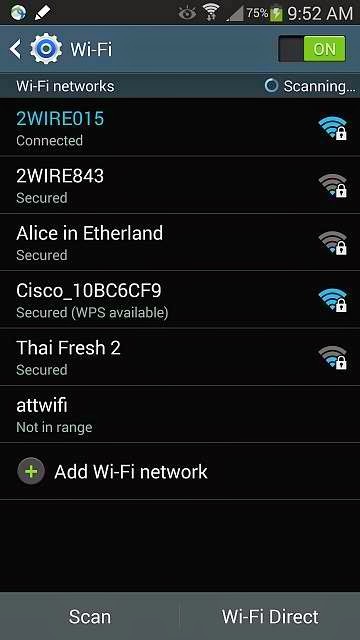 To add a wireless network back on your device, touch the network name you want to connect to. HINT: If you are trying to connect to a secured wireless network, you need to enter the correct log-in details (password). To ensure you are keying in the right password, touch Show Password to display the password you type. If the problem persists, try to use a different Wi-fi network to connect to instead. If you are able to connect to the Internet using a different wireless network, then most likely the problem is on the first network you are trying to connect to. If you cannot connect to either wireless network, the last suggestion is to reset the device to factory defaults. IMPORTANT NOTE: Bear in mind that by performing a factory data reset, all customized or personal information stored in your device will be erased. So better yet, create a back-up of all necessary files before you finally proceed to performing a factory data reset on your Galaxy S5. very helpful info.. My issue is when I am @ a Wi-Fi that requires extra login or "accept the terms". When I open a new window in the browser, the login page does not load. I tested this issue in similar Wi-Fis and the problem persists. It works fine however if no extra login is required. Any insight?